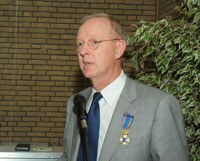 Jan Karel Lenstra, former general director and researcher at the Centrum Wiskunde & Informatica (CWI) in Amsterdam, was awarded with a royal decoration on 4 November 2011. He was named Knight in the Order of the Netherlands Lion. Alderman Eric Wiebes of the city of Amsterdam presented the cross to him at the symposium that was held in honour of Lenstra’s retirement as general director at CWI. This royal decoration is awarded to citizens with outstanding achievements in the field of arts, science, sports or music. Wiebes praised Lenstra for his scientific achievements in mathematics and his efforts for the scientific community as a whole. In his speech Wiebes emphasized Lenstra’s leading role in mathematics in the Netherlands and his plea for investments in the knowledge society. He also memorized Lenstra’s work as chair of the ‘Commissie rekenonderwijs op de basisschool’ (Committee on Primary School Mathematics Teaching) of the Royal Netherlands Academy of Arts and Sciences (KNAW) and his pioneering and influential scientific work. Together with Eugene Lawler, David Shmoys and Alexander Rinnooy Kan, Lenstra edited the book ‘The Traveling Salesman Problem’, which is still a worldwide standard work. Wiebes further mentioned the new innovative lines of research that Lenstra introduced during his directorship, such as cryptology and life sciences, and the strong embedding of CWI in national initiatives. Jan Karel Lenstra started his academic career at CWI, which was known at the time as Mathematical Centre. From 1969 to 1989 he was a prominent researcher at the institute. He became professor of Combinatorial Optimization and Dean of the Faculty of Mathematics and Computer Science of Eindhoven University of Technology. Then he left for the prestigious Georgia Institute of Technology in Atlanta (USA). From 2003 to 2011 Lenstra was general director of CWI. To thank him for his efforts, CWI management recently decided to appoint Lenstra CWI Fellow. Lenstra remains affiliated to CWI and will focus on research and administrative duties. Picture: Jan Karel Lenstra. Photographer: Peter Lowie.